Online Forms vs. Mobile Forms: What's the Difference? Business software categories can target very specific needs. While online forms and mobile forms may seem like the same thing, they serve different functions. Compare data collection via online forms to collection via mobile forms to understand the differences between the two types of business apps. Learn how your business can benefit from each technology. Online forms are customer-facing web forms. They're typically embedded within a webpage, as in the case of a contact form. Alternatively, an online form can be the entire webpage, as in the case of a multi-page customer survey. Online forms are filled out by using a web browser. This means that the forms can be filled out either from a computer or via a mobile device. However, online forms aren't typically filled out via a mobile app. For example, SurveyMonkey is a major provider of online forms, but the SurveyMonkey app is used for form management and analysis rather than for completing surveys. While online forms are powerful tools for connecting with customers or leads, they’re not suited for how internal business information is collected or shared. Mobile forms are used to collect data about business operations by using a smartphone or tablet. For example, mobile forms are used by facilities management companies to manage inventory, and they're used by utility companies to submit field inspections. Frequently, mobile forms are also used to improve the communication between field workers and office workers. The remotely collected data is accessible instantly, can be sent to any destination, and can be automatically formatted into a customizable PDF. Because the technology is a powerful tool for desk-free environments, mobile forms are transforming industries that are traditionally paper-heavy, such as construction. Mobile forms are also a known productivity booster. Data is accessible three to five times faster, and field workers save an average of 11 hours per week. Additionally, by using automated workflows, business operations can run like clockwork without relying upon employees to shuffle paperwork. Whether mobile forms are used to survey geographic regions, to submit information from a manufacturing floor, or to gather information at an event, they can help your business go paperless by using technology that’s smart, integrated, and flexible. Can Mobile Forms Also Be Online Forms? Sometimes, mobile forms are also online forms because information can be submitted via a mobile app or through a browser. 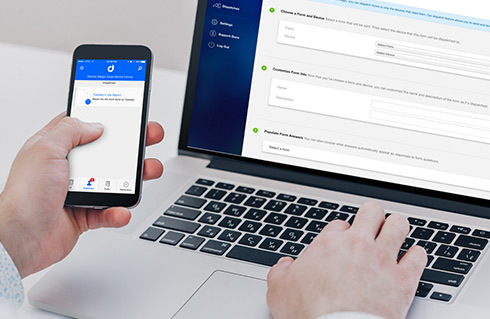 For example, enterprise users of Device Magic's mobile forms also have access to a web app that allows users to submit information from either a mobile device or a desktop computer. This functionality provides flexibility for situations when business forms are completed in the office, a phone battery dies, or a contractor needs one-time access without downloading the app. How Can Mobile Forms and Online Forms Work Together? When using mobile forms, submitted information can be integrated into a wide set of other business software. For example, the built-in integrations that are available through Device Magic’s mobile forms platform include several online forms providers, including Mailchimp, Constant Contact, and Wufoo. When using these integrations, it’s possible to create full-circle information-gathering scenarios. For example, a driver of a delivery shipment would use a mobile form to submit a delivery confirmation. This could then trigger an automated email to the customer with a customized receipt. The information about the delivery would then automatically update the customer’s Mailchimp record. This would then enable you to customize your email newsletters in Mailchimp by referencing the customer’s most recent purchase. Mobile forms are changing how businesses work with information. Find out how Device Magic can help you ditch paperwork and automate processes.